There are three creative aspects offered by the exposure controls on a camera — motion, depth of field and noise. The shutter speed controls motion. The aperture of the lens handles the depth of field while the ISO has two jobs, adjusting the sensor’s receptiveness to light and how much noise (aka grain) appears in the photograph. This article is about motion — the shutter’s domain. It can freeze fast action or create dreamlike blurs of motion. It’s all a matter of the amount of time the sensor gets to see light. The shorter the time, the sharper the photo — freezing a landing jetliner speeding by at over 160 miles per hour for instance. 1/1600s freezes this jetliner landing at over 160 miles per hour. The more time the sensor sees a scene the more blur occurs on moving subjects. 1/80s without panning the camera leaves the background sharp and the bicycle an interesting blur. 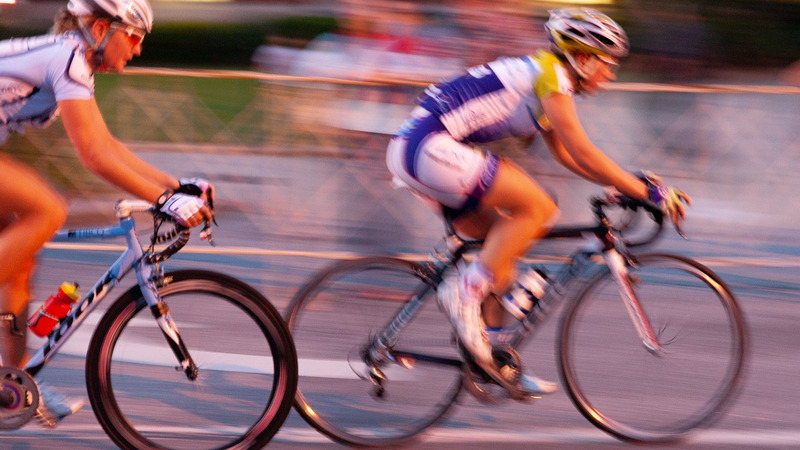 1/40s while panning the camera with the cyclist blurs the background to abstraction while showing the subject’s speed. The shutter is a wonderful side of the creative triangle. Next up, focus and blur the second side of the creative triangle. It’s the realm of the aperture.